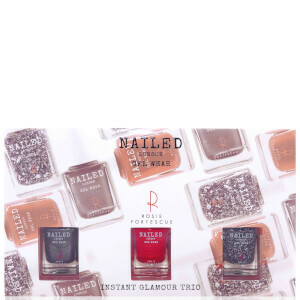 Nailed London is a collection of high quality and fashion forward nail polishes, created in collaboration with Rosie Fortescue. The collection itself is made up of polishes that form a unique and patented 3-step system that deliver the effects of a gel manicure, without the need for light lamps, so you can do your nails in the comfort of your own home. Inspired by the catwalks and Rosie's love of fashion, Nailed London has a fabulous selection of different colour and textured polishes so you can mix up your look whenever you feel like it.